AL ASAD AIR BASE — In a line of Marines from Team Tank, Regimental Combat Team 1, one man stood out in his gray digital uniform as he participated in a combat-marksmanship program shoot. Army Sgt. 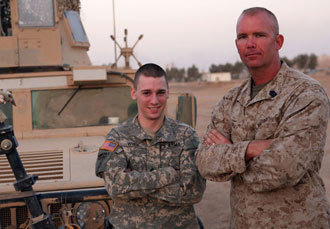 Shane M. White, 22, an information systems specialist with 4th Psychological Operations Group, based in Fallujah, was participating in the shoot with the Marines at the invitation of their company first sergeant, 1st Sgt. Joseph C. Gray, who also happens to be White’s father. The Soldier and his Marine dad reunited here for three days. It was the first time in more than a year that they’d seen each other. “The last time I saw my son was last September, for one day, at his wedding,” said Gray, who has been in Iraq since April on his second deployment here…. My regular readers know that for me it is ALL about family. Go read the rest of this B*N*S*N story here.